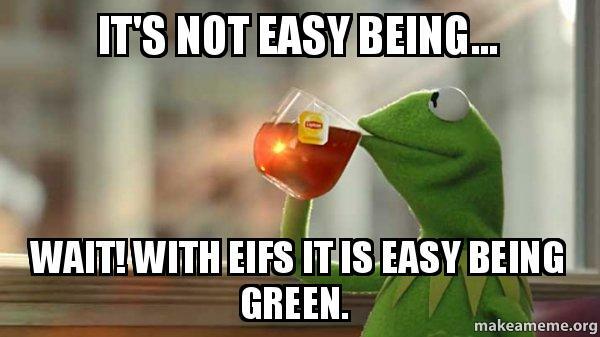 As Kermit the Frog would say, “It’s not easy being green.” He clearly was unfamiliar with the exterior wall cladding system, EIFS. Today, green can mean the color of a frog, clothing you wear on St. Patrick’s Day, or the energy and environmental features of a building. With a growing focus on energy efficiency and environmental building materials, easy solutions aren’t always quick to come by. However, when keeping all options on the table you’ll quickly find that exterior insulation and finish systems (EIFS) can meet both of these desires. …takes 16 times fewer tractor trailer trucks to transport 25,000 square feet of material compared to brick and 6 times fewer than stucco. Imagine the air pollution that won’t be given off as a result. …has low to no volatile organic compounds and uses recycled content when possible. …has 1/5 the global climate change impact as brick, meaning the carbon footprint is also 5 times less. …outperforms brick in thermal performance according to Phase III of a study conducted by Oak Ridge National Laboratory on Hygrothermal Performance. …is 84% more energy efficient than its competitors. …is the original and easiest way to achieve Continuous Insulation for your building. You can take a quick look or a more extensive one, but either way the results will show that EIFS makes it easy to be green.